It is only with new content that you can reach out to your audience on a regular basis and bring them back to your website. After the launch of your brand new website and the traffic you generated by announcing it to everyone you know, your website eventually falls into dormancy unless you do something about it. What can you do to keep it active, get traffic to your website so that it shows up higher in search results and brings you business? The simple answer is – CREATE CONTENT – so that you have the means to cultivate a relationship with your audience. With just the copy pages on your website you can bring people to your website once. 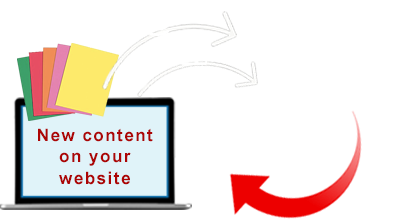 With newly created content for your audience, you can invite them to visit your website again and again because the purpose of your content is to serve them better. Make what you share be helpful, insightful, inspirational and such that it provides genuine value to your audience. Don’t create just anything for the sake of having some content on your website. That would be a waste of time for you and a sure way to lose your audience fast. Copy is text that covers subjects of who you are, your products and services. In other words – it is about you, even when you write it in a client-centered style. What you offer, the description of products and services, terms and conditions are all part of the copy of your website. Content is additional, bonus material that you provide as a helpful, insightful, problem-solving or inspirational resource for your audience. Content can be articles, tips, tools, written or video blogs, poems and stories or any other resources that helps with what your audience needs. What kind of content to create? is the only kind worth creating and sharing. Educating your prospective client is an investment into a good relationship with your future client. Content that helps your prospective client understand better their own issue, problem or situation, can prepare them to be more engaged in solving their problem by utilizing your services. A well informed client is essentially a better client. Being already empowered by a greater understanding of their own situation (with the help of free content you provide) they will most likely be interested in the paid services you offer as well. Have you noticed in working with clients that they come to you with expectations based on misinformation or misunderstanding? Instead of using appointment time with your clients to clear those typical misunderstandings, you can create content that covers those subjects so that your time with a client is reserved for a focused time providing the services. One of the major factors for success is getting a right kind of support when we need it. C O M M U N I T Y – as you cultivate a relationship with your audience by creating and sharing content, you provide a sense of community to those you share with. By creating relevant content in which your audience can recognize their own issues, concerns or interests, you provide a remedy to feeling stuck or alone. T I P S & T O O L S – being given a practical step-by-step how-tos, handy shortcuts or general guidelines on how things work is often the needed support to get us from point A to point B. This most practical aspect of supplemental content is often, if not a solution to a problem itself, a step towards dealing more readily with the problem directly. U N D E R S T A N D I N G – the right understanding at the right time can be a prospective shift to the extent of seeing things in a new order of priority and often with a new clarity of relevance. Inspirational content goes beyond any visible link to your product and services. This is simply a human sharing with another human. It is the emotional and soulful nourishment that sustains us through the greatest of difficulties in any area of life. It is good to remind each other by sharing such content, that we are all in it together – each of us capable of experiencing the same human suffering and joy. With nourishment of meaning we go deeper and higher. Nourished by beauty, we open up more and when humor hits the right spot we instantly feel lighter. True examples of others overcoming obstacles and succeeding motivates us to be more courageous in our own lives. A lot can be shared as resources of inspiration; poems and stories, photography and visual arts, music, videos, recorded performances, interviews, quotes, etc. When you use other people’s work, make sure attribute the source but also include your voice as commentary on the piece, or simply state what has moved you to share that piece in the first place. What’s holding you back from creating great content? Whatever you experience that holds you back, is an obstacle or simply an excuse – You can do it! We give our time to things we perceive as necessary or desired. When we don’t have time for something we want we re-prioritize and make the time we need. It is not required to be a writer to create content. You can be a curator, with permission you can use other people’s work and give it a short personal commentary that expresses to your audience the value you see in the piece you share. You can also use podcasts (recorded audio) or expressive means of photography and art to share your message of support. Besides professionals there are many people out there (including people you know) who are comfortable with technology and who would appreciate a paid gig to post content for you (as long as you can create or find content pieces yourself). You can start by identifying what kind of support your audience (clients and prospective clients) could use to get greater results from utilizing your products and services. You would be surprised how creating such a list could motivate you to do something to help your clients. You don’t need to. One of the most effective ways to create and share content is teaming up with other professionals like yourself (who are not your competitors) where each of you share each other’s content with your respective audience. This is an inquiry process comparing what you offer with who your clients are, their needs, concerns and interests. Before you start creating content, have a solid list of topics your audience is interested in. How do you share with others in your life? Are you a natural story teller or an educator? Do you often recommend things to people and explain why they should read a particular book or try a specific product? Do you get excited about a video on YouTube and must share it with friends? What about experiences, people and stories you come across that move you and inspire you? Now that you have identified what your clients and prospective clients need, and you have clarity on what ways of sharing information is natural for you, you can build a map of how you can go about offering support to your audience. Some items will fall into the category of one-on-one consultation (with a plan to eventually create pieces of content for it), some will clearly be articles, others stories, interviews and videos to share. Organize your content-to-create items by priority – from basic information anyone can use to more specific pieces pertaining to each stage of your service or a particular category of clients. Use some form of calendar/planner to assign those content items a realistic deadline. Pace yourself knowing how much time you can put aside weekly for content creation. Treat creating content time as you treat anything else that has appointment time in your schedule. How often do you want to share content with your audience? Will it be by sending a newsletter or group and individual emails? Announcements via Facebook or links from other platforms? Once you decide on what’s doable for you, stay consistent, as being consistent is one of the qualities of being professional. Your audience needs to learn when and what kind of support they can expect from you on a regular basis. To grow your audience email list it is not enough to just ask people to sign up for your upcoming newsletter. These days you want to give access to a piece of content as genuine value to those who are willing to give you their email address for it. This kind of content can be a link to a content page that otherwise cannot be accessed or a link to a downloadable content your prospective client can use as a practical tool.